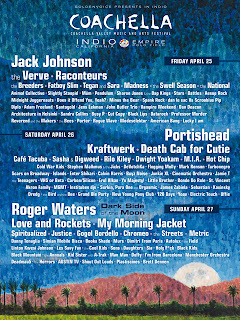 The Coachella festival 2008 lineup has been announced and the Saturday, April 25th in particular is looking good. The festival takes place April 25th, 26th and 27th in Indio, California. Quite a contrast to a festival like Glastonbury with daytime temperatures get up to over a sizzling 100°F! Wowch! Saturday is glaring at me and then I sadly realise I won't be able to be there-sure there will be a few more festivals like this during the year. I saw Kraftwerk on their last tour through the UK at the Brixton Academy a couple of years ago and they were amazing. But Portishead on the same day- that's sure to be a cracker! And then my next new favourites, Hot Chip. Dan le sac Vs Scroobius Pip, I'm sure some Dark Side Of The Moon will be gratefully received on the Sunday when the festival goers are craving their sanity back after that Saturday line up. It's a long time since I heard anything about Kraftwerk. Reminds me of Berlin.